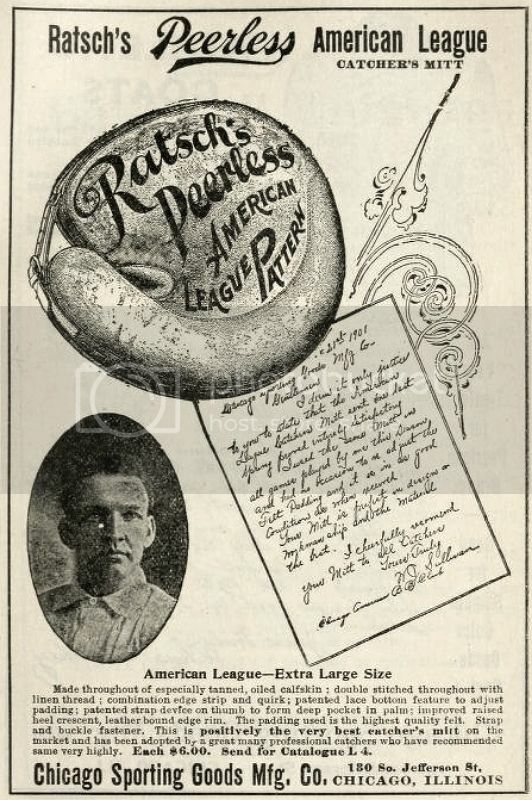 Here's a neat ad for Thomas E. Wilson's Ray Schalk catchers mitt - sweet buckle strap for webbing. I saw that ad years ago at an antiques show. Sorry I didn't buy it then. It's from a 1921 Saturday Evening Post. The Wilson Ray Schalk buckle web model is a rare one. Below is another Schalk ad with Rogers Hornsby and Bill Terry. It is from circa 1927. It is a big cardboard counter display at about 20" wide to display three gloves/mitts. mikesglove wrote: I saw that ad years ago at an antiques show. Sorry I didn't buy it then. It's from a 1921 Saturday Evening Post. The Wilson Ray Schalk buckle web model is a rare one. 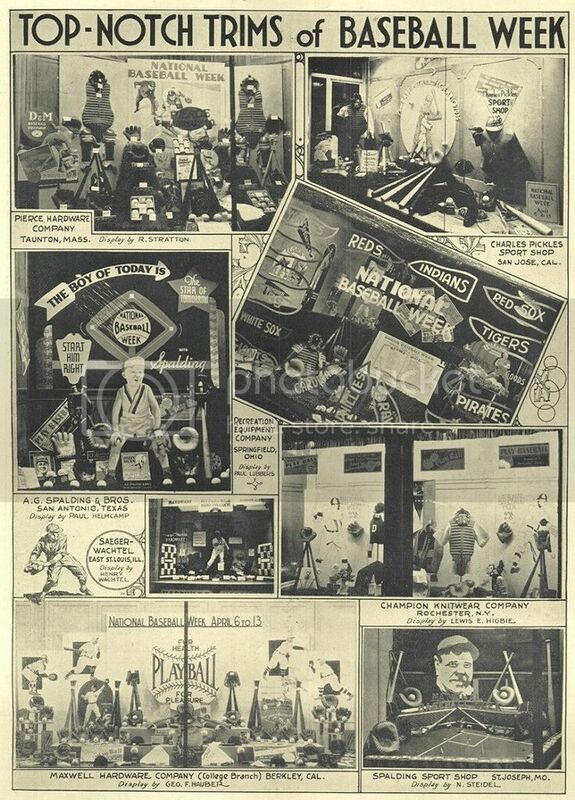 Below is another Schalk ad with Rogers Hornsby and Bill Terry. It is from circa 1927. It is a big cardboard counter display at about 20" wide to display three gloves/mitts. A 1935 full spread magazine ad. 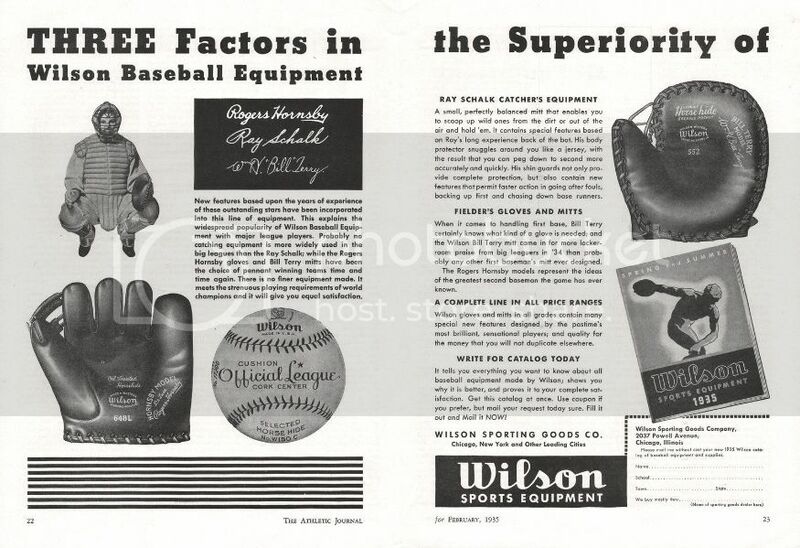 Wilson got a lot of mileage from their three top endorsers. More Goldsmith rarities although I think Josh has these and more! A 1936 ad for the "George Selkirk" model with a cool snare web. 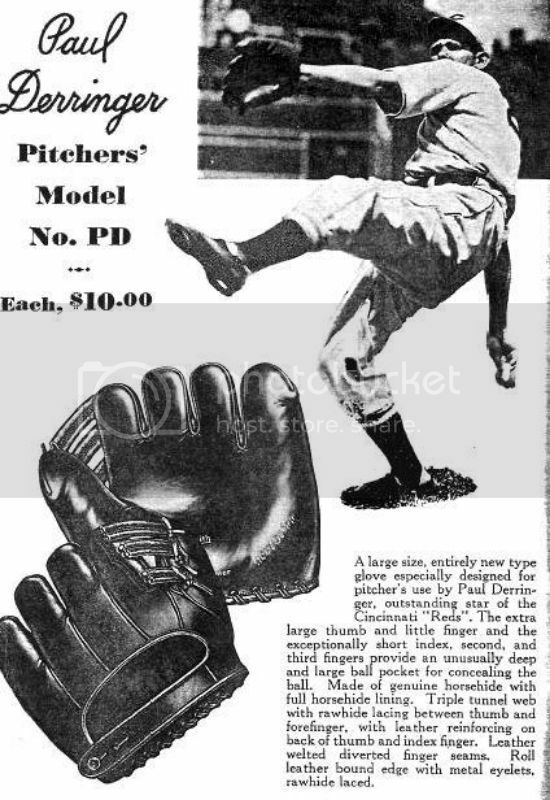 A 1936 ad for the "Paul Derringer" extended pocket model glove. Also endorsed by Eldon Auker, Johnny Vandermeer among others. 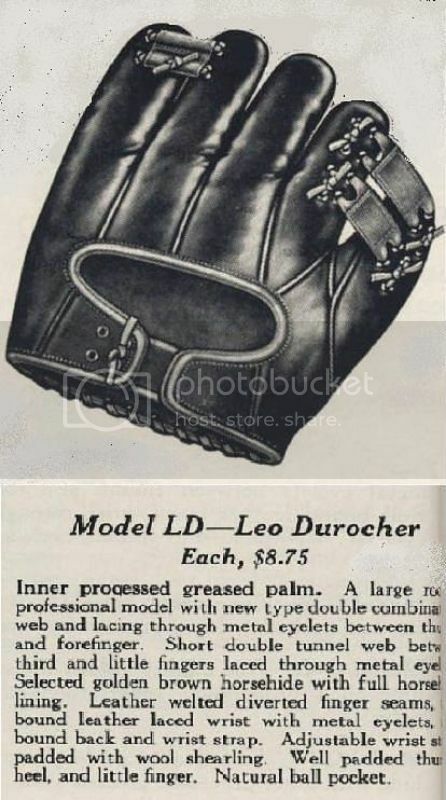 A 1940 ad for the "Leo Durocher" model glove with intricate adjustable laced web and pinky. 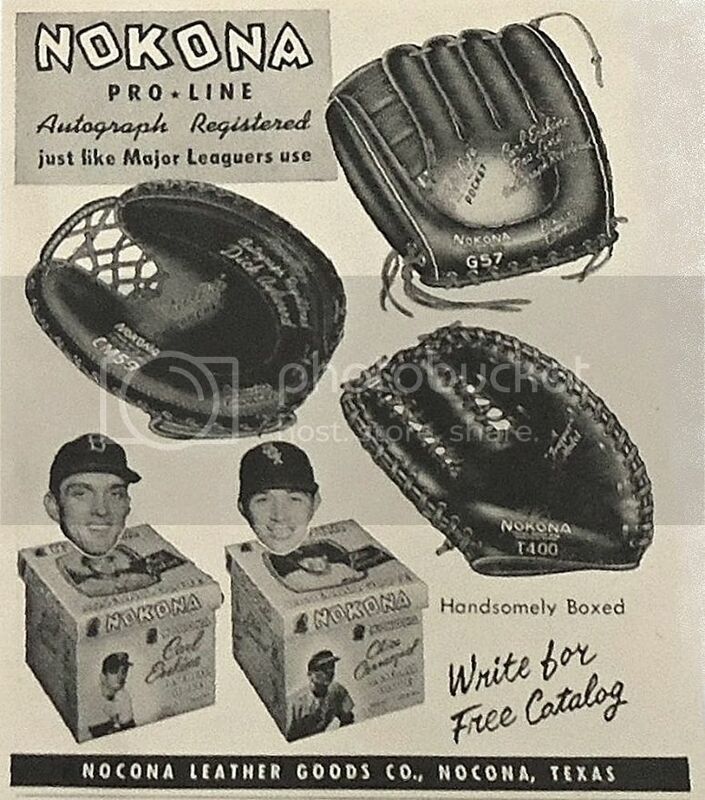 A really rare 1935 Dubow ad for some equally rare gloves & mitts. 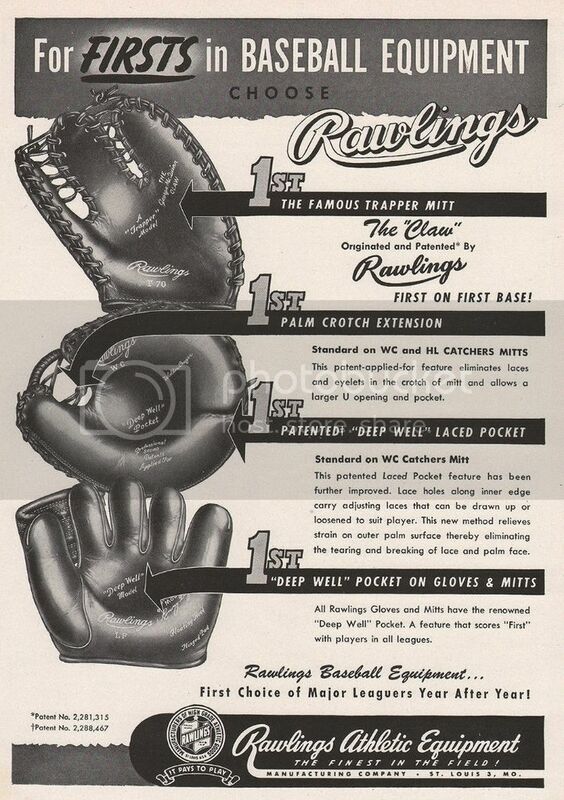 The Bridges glove in the ad is interesting - fingers are similar to some of the OK Models of the 1940's. Has one surfaced? I looked on JD's site and didn't see any pictures. 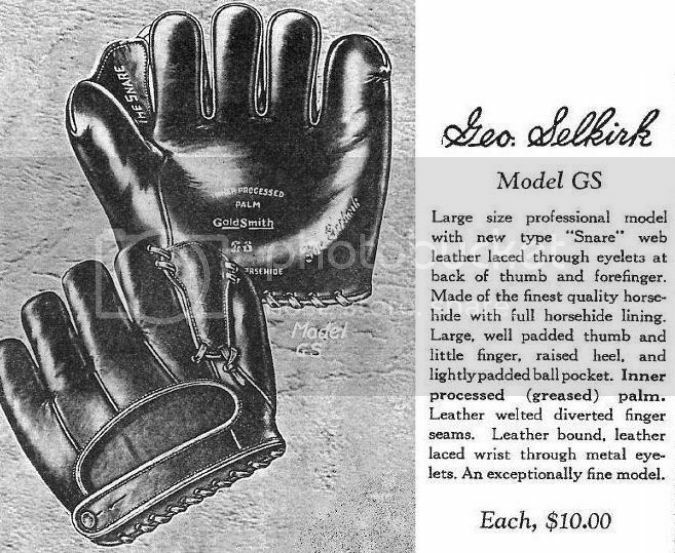 I have the Goldsmith Selkirk glove shown in the ad. Sweet glove! I would love to find either the Tommy Bridges or George Selkirk models. They are both pretty cool looking. A few ads from companies showcasing their top three models for the year. 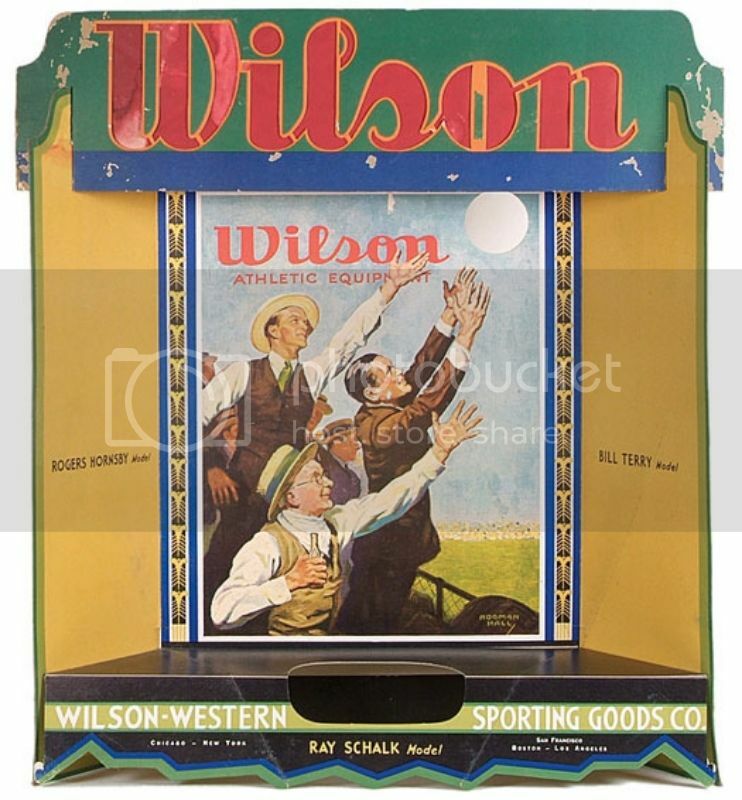 First is a 1941 Spalding ad. A 1955 Nokona ad. The two picture boxes are pretty nice. 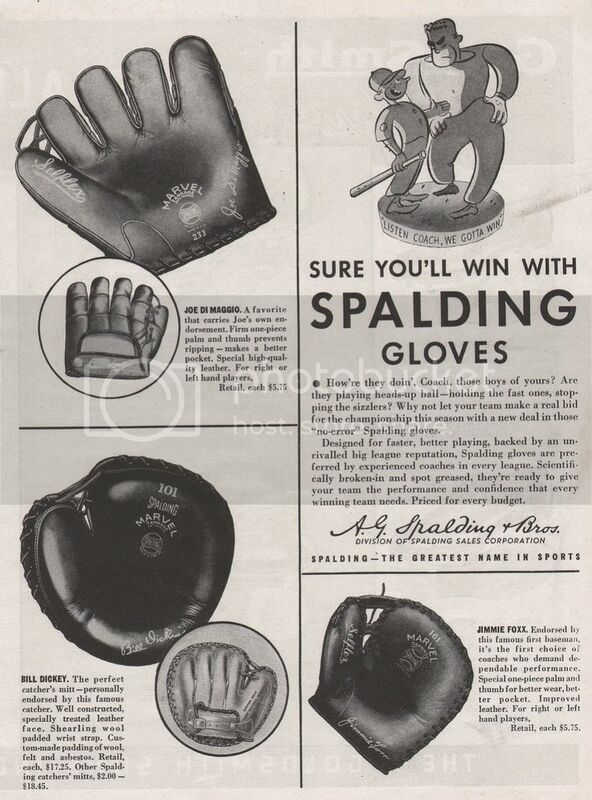 Below are two full page ads from a Shapleigh's 1910 catalog featuring Diamond brand gloves and mitts. They both feature hang tag endorsements touting the quality of the particular model. The first is the Ganley model. The second is a Stephens model and priced at a whopping $12. Even the best Reach models were selling at $8 in that time period. 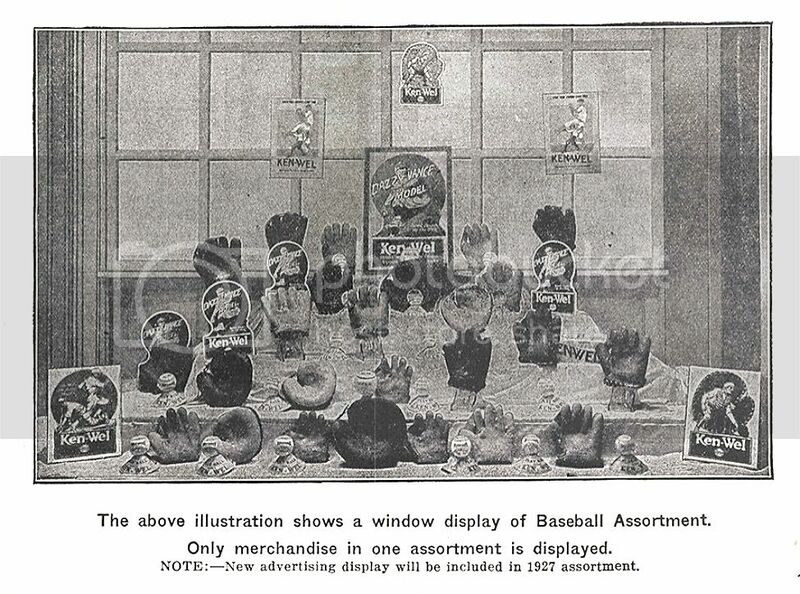 This last ad is pretty cool from a Lajoie Baseball Guide. 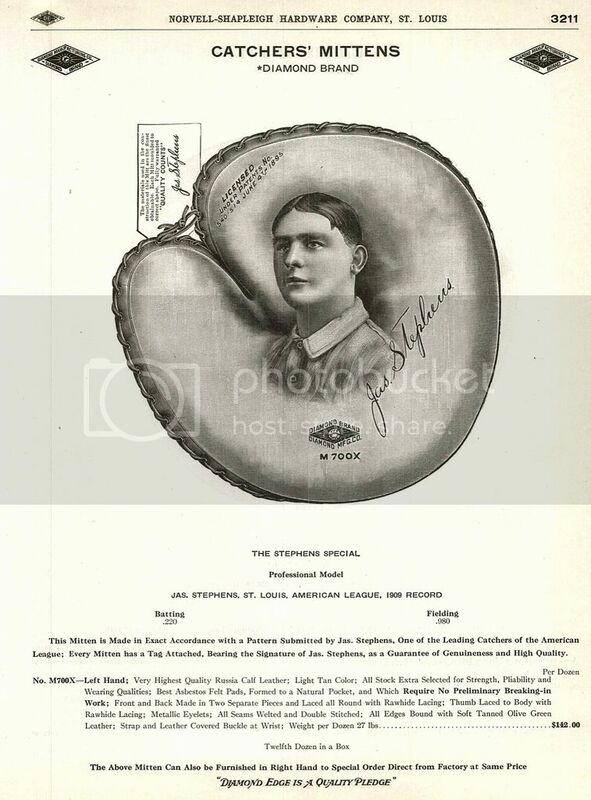 Instead of a hang tag endorsement, there is a handwritten note from White Sox catcher Billy Sullivan Sr. from 1901 as part of the ad. 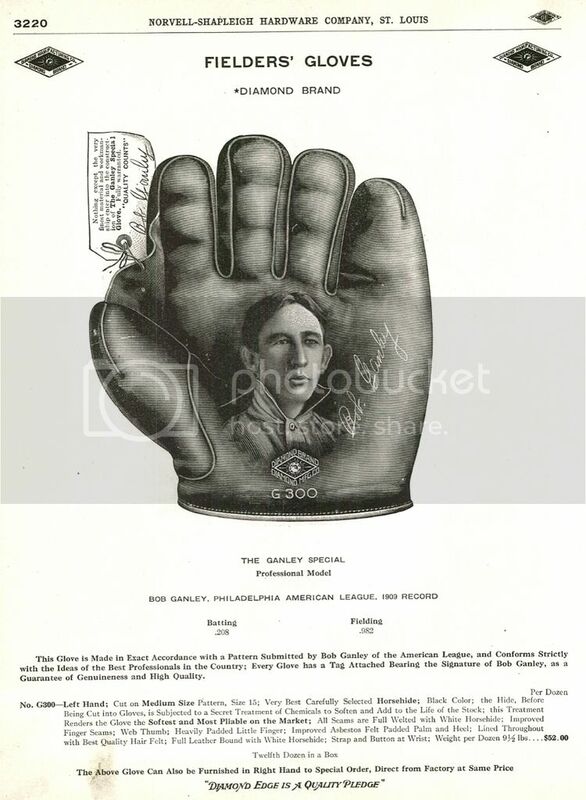 This mitt became known as the Sullivan model in TOC Sear's catalogs. My old stomping grounds of San Jose,CA. represented. 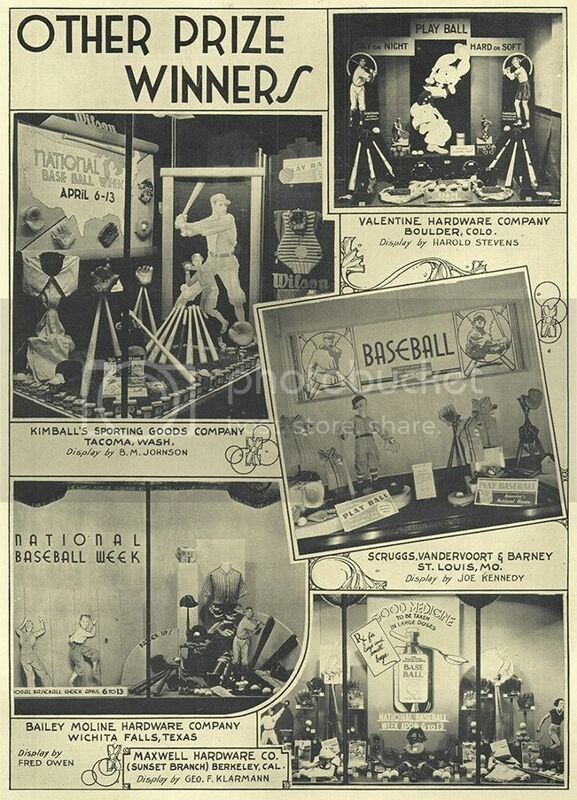 A nice retail store window display circa 1928 from KenWel. The cardboard counter glove ads were included free as part of a package glove order from KenWel. The lonely stepchild of the Gehrig zipper back mitt. I haven't see one of these surface in a long time. Hey, check it out! 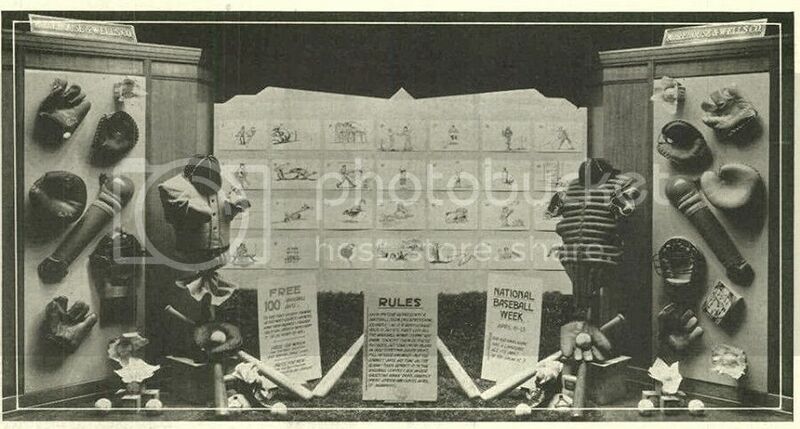 There's the Lou Gehrig cardboard display that everyone said never* existed. Last edited by Number9 on July 8th, 2015, 1:35 pm, edited 1 time in total. Number9 wrote: Hey, check it out! 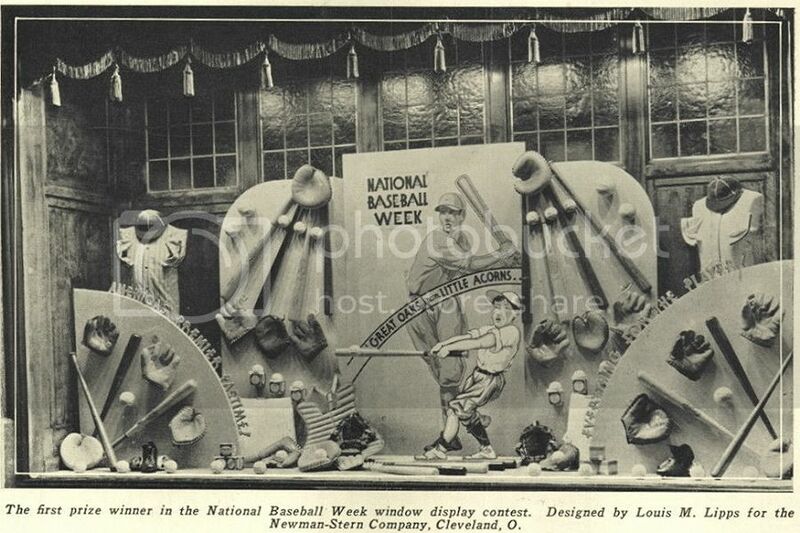 There's the Lou Gehrig cardboard display that everyone said ever existed. 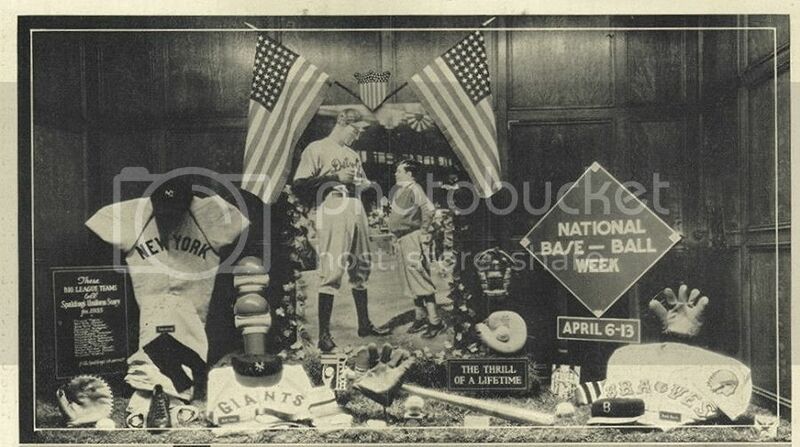 Here a reproduction of the Gehrig cardboard display from above. I see it at flea mkts. and on ebay a lot. Are you saying an original has never surfaced or what?